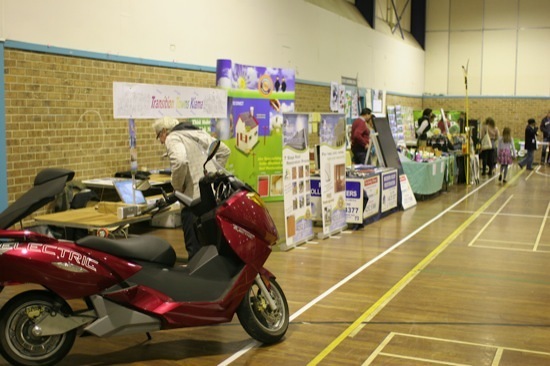 Kiama FutureCare partnered with Kiama Council to put on a fantastic Sustainability Expo at the Kiama Leisure Centre to mark World Environment Day on Sunday. 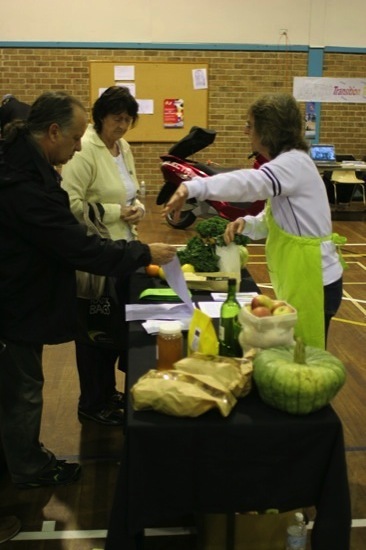 The Council also held an open day in the nearby Kiama Community Garden to coincide with the event. What can I say – it was an excellent event! Really well-planned and promoted in the runup, and very smoothly executed on the day. I helped out on the Jamberoo FutureCare booth until midday, then had a quick look around the Community Garden before heading home to prepare for the afternoon’s Jamberoo Community Growers meeting on backyard beekeeping. Kiama Deputy Mayor Ben van der Wijngaart’s electric motorbike was on display at the entrance to the expo. You can see a booth for the fledgeling Transition Towns Kiama initiative just behind it. 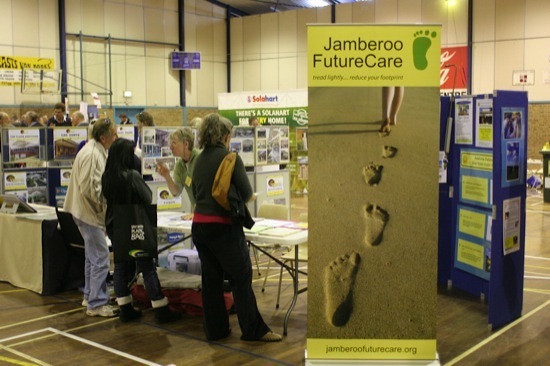 Here’s the Jamberoo FutureCare booth, where I helped out for a couple of hours in the morning. Mostly we had information on solar power and solar hot water, but also had people with a wide range of experience in all aspects of trying to live more sustainably. Do you like our new vertical banner? 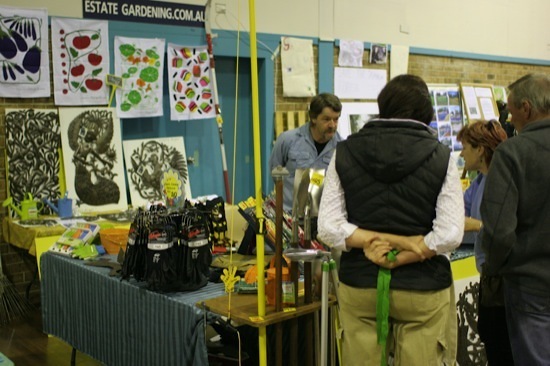 Paul Kirkpatrick manning the stand for his Jamberoo business, Estate Gardening. Paul has helped out Jamberoo Community Growers a lot in the past, and will be our guest speaker on July 3 talking about espaliering fruit trees. He sells a wide range of very high-quality garden tools and garden art. I bought a fantastic pair of Ninja gardening gloves for just $10, which are close-fitted and waterproof for weeding comfort but nice and strong for use with shovels etc. Being a professional gardener, Paul knows what he’s talking about when recommending tools and equipment. Green Box is a cooperative based in Gerringong, aiming to source produce for members from within a 100-mile (160 km) radius. They want to support local farmers and producers, and even source some stuff from local backyard growers who have a surplus. I’ve had a bit to do with them in various sustainability initiatives, and they’re all very committed and passionate local foodies. Interesting coincidence – Fiona from the Inner Pickle blog, who I finally met in-real-life the day before the Expo, is on their committee. Chrissy (in the headband!) 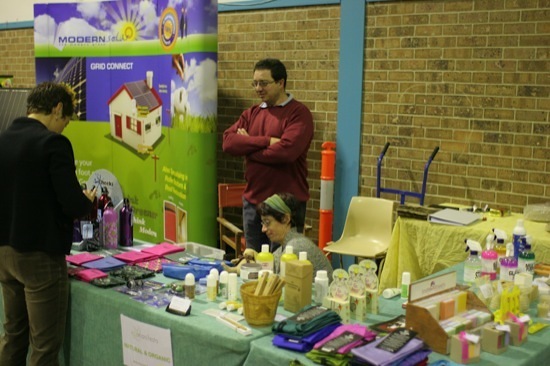 from Eco Manifesto, a Gerringong company supplying eco-friendly products for the home. It’s worth signing up for their newsletter at their web site to get notice of new products, specials, and eco-living tips. 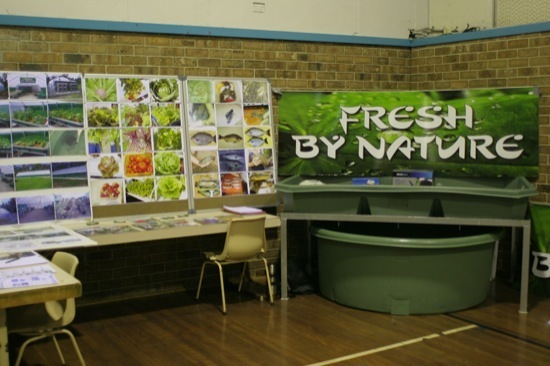 Another Gerringong company, Fresh By Nature provides services and equipment for hydroponics, aquaculture and aquaponics. The owner John Burgess has also helped out Jamberoo Community Growers, delivering an excellent presentation on backyard aquaponics. 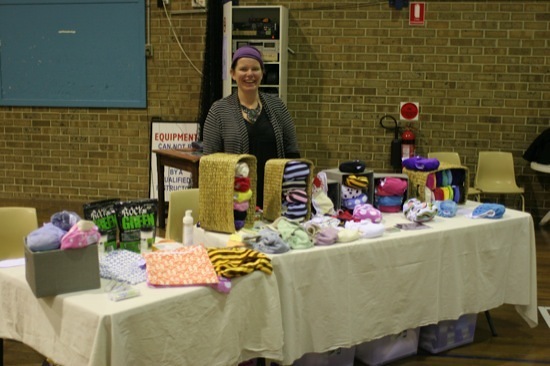 Evelyn from Nappiness, showing off her range of eco-friendly reusable cloth nappies, nappy covers, and baby products. She also has a great blog about choosing and using cloth nappies. Don’t you love the funky designs? These aren’t your mother’s cloth nappies! 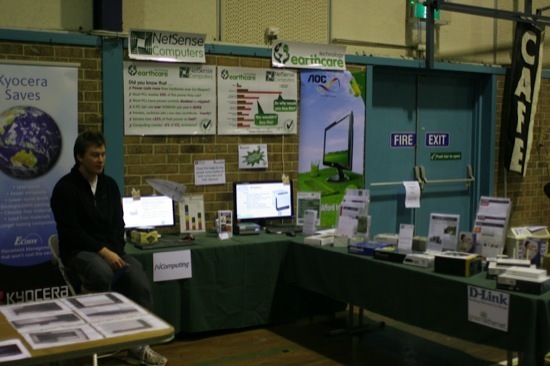 Edwin, owner of Kiama company NetSense Computers, is a member of Kiama FutureCare and was one of the organisers of the Expo. They offer good quality computer services at very reasonable prices, as well as parts, upgrades, peripherals and new systems. They have a very interesting range of low-energy-consumption computers. 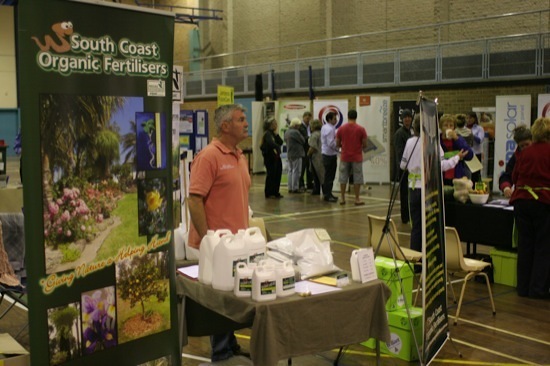 South Coast Organic Fertilisers are based at Tomerong (just past Nowra), and supply worms, worm castings, and worm liquid for your garden. 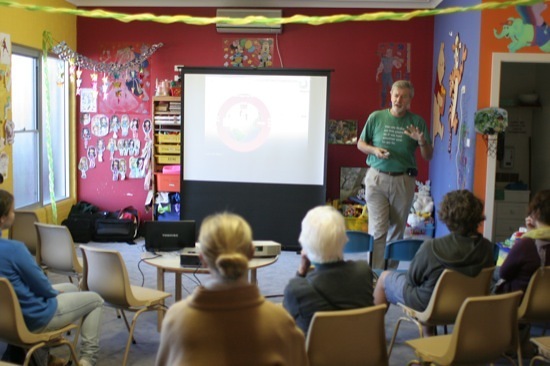 Deputy Mayor Ben van der Wijngaart was one of the presenters of a variety of talks on sustainable living issues. I wasn’t able to attend any talks, but did hear positive reports from others that attended. In case you’re wondering, Ben’s not headlining a 5-year-old’s birthday party – the talk was in the room normally used for a creche by the Leisure Centre. 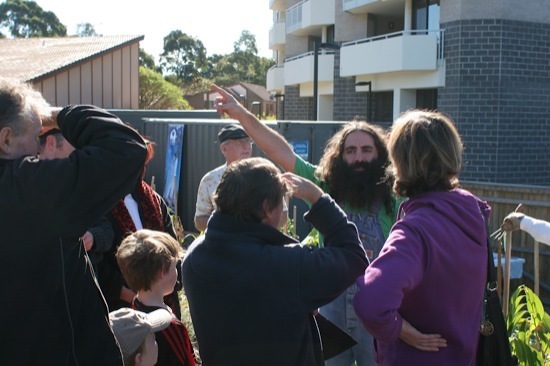 Costa, of SBS’s Costa’s Garden Odyssey fame, lent a little celebrity flair to the Kiama Community Garden’s workshops and information sessions. He was extremely popular with the kids, and gave a ton of information to the adults as well. 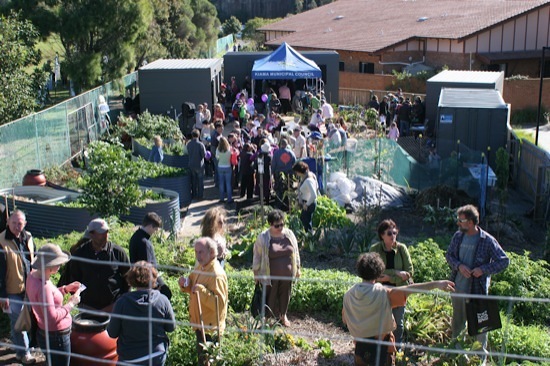 This shot was taken from about halfway up the slope of the Kiama Community Garden, looking back down at all the Council activities taking place. I got a lot of great ideas from the garden (it was the first time I’d had a good look around it). It was good to see how they’d used the slope of the block, and I’ve now got a lot better idea about how I’m going to develop the growing areas on my sloping block. All up, the Expo was a really good experience. I saw a lot of people there I knew (including Ally from HappyEarth), and met a few new friends as well. Everyone was really friendly and seemed to be having a good time, the weather was great, and the turnout was excellent. Did you go? What did you think of the day? It looked like a great day. Costa still has his long hair and beard.. I think it was great they incorporated the community garden this year too. @Donna: Yep, Costa’s still short and hairy! I wish I had half his energy! The Leisure Centre was a good venue – lots of space in the main hall (good if the weather turns bad), and the community garden is right next door. Parking is always a little tight there, though, especially if there are any sporting events on the same day. Looks like a great event Darren. I attended one recently in Sydney, where I met some great people and learnt heaps.